There has been a great deal of news coverage about the tariffs being levied on products by the current administration. Two rounds of tariffs are already in effect with a third yet to come. The first two lists imposed a 10% tariff on specialty resins and phthalate plasticizers used in rubber. The tariffs will effect almost every rubber recipe in the marketplace. The China tariffs will not only affect raw materials and materials made overseas, but also may affect the prices of rubber products made in the United States. With a few exceptions, rubber chemicals represent 10-20% of a recipes cost. Rubber chemical increases of 25% would result in increases of 4-5% of an average recipes cost. At Grand River, we are working hard to not only educate our customers about the new tariffs but also to develop the best quality and most cost advantageous lathe cut gaskets in the market. We are evaluating the current lathe cut gasket materials our customers are using and determining if other materials not affected by the tariffs can be used in replacement. Also, many finished goods from China have a 25% tariff, so it may be more cost advantageous to have your gaskets manufactured in the United States. Grand River Rubber & Plastics prides itself on providing unmatched quality and top-of-the-line service. Responsiveness, quality products, competitive pricing and on time delivery are just part of our commitment. 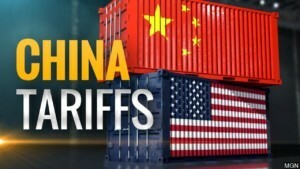 We look forward to speaking with you about your materials and helping you determine which materials are the highest performing and most cost effective for your application with the new China tariffs in place.